So what can you do in Hakone Japan that you can’t do anywhere else in the world? Bathe in a huge tub of soy milk. October 12th was the soy milk festival in Japan. To celebrate, an onsen in Hokone Kowakien provided soy milk baths for their guests. I have heard that milk is good for the skin, and spas do offer milk baths. I have a hard time seeing myself in a tub of milk. 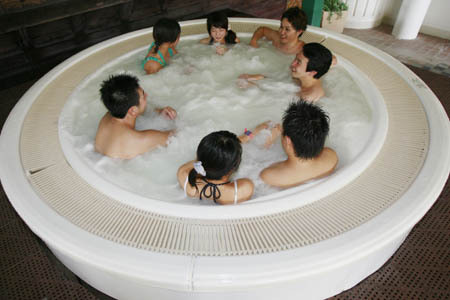 I know Americans dont have the same hot spring, soaking, desires that many in Japan love. It’s probaly due to the fact that we live in such a rushed society. I can’t even remember when I actually sat down in a tub. Can you? Via Rising sun of Nihon.